Welcome to Hattycakes Online Store! These are our current In-Stock, Ready-To-Ship Items. We are also able to re-create any piece you see here in a different color combo or size. If an In-Stock item showcased in our Online store doesn't fit the bill, please visit our Custom Order Design Center, leave a comment at the bottom of this page or contact us directly hattycakes_email@yahoo.com with the specifics of what you're looking for. 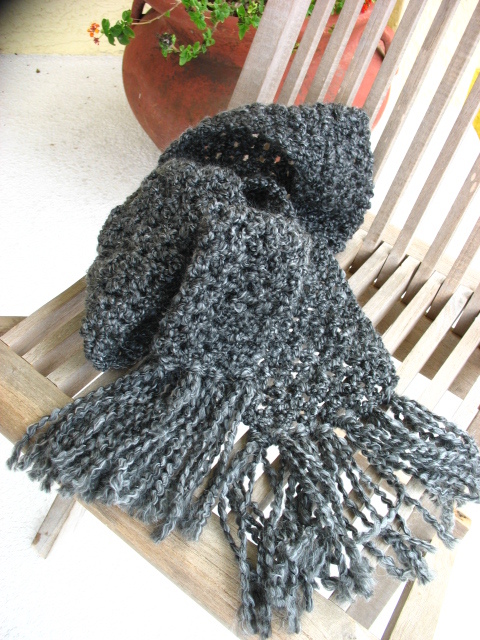 This soft cozy Edwardian scarf has been crocheted with soft and silky 100% Acrylic Yarn. 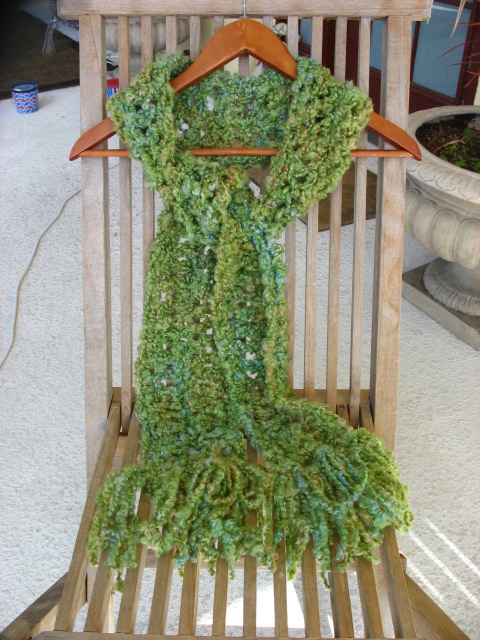 Scarf measures 60" in length and is 6.5" wide and features 6" of fringe on either end. 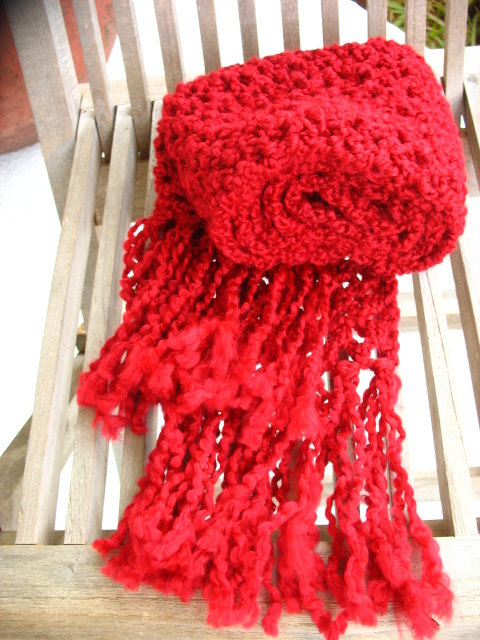 This soft cozy Candy Apple Red scarf has been crocheted with soft and silky 100% Acrylic Yarn. Scarf measures 56" in length and is 6.5" wide and features 6" of fringe on either end. Crocheted in a soft 100% Acrylic yarn in the same hue as your morning cup of java, this hat is just the right accessory to perk up your day. 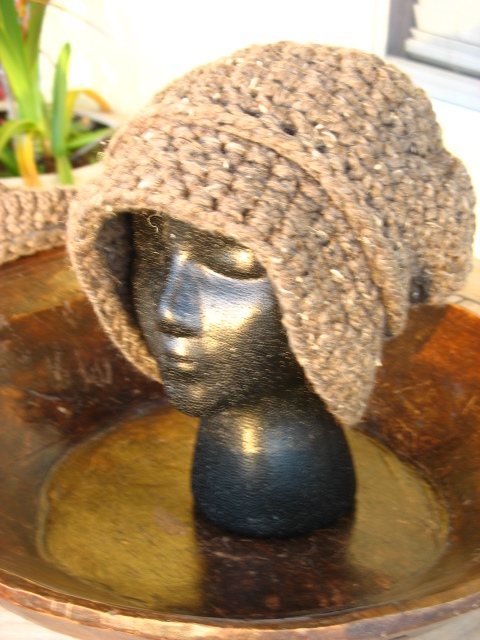 This hat is one size fits most,it measures approx 22" in diameter and the hat height is 8". Another wonderful addtion to the Hattycakes Line! Get your Rich Chocolate Fix from these positively delicious Chocolate Wristers measuring 8" in length 8" in circumference at the wrist. Other Colors are also available, please convo seller for options. 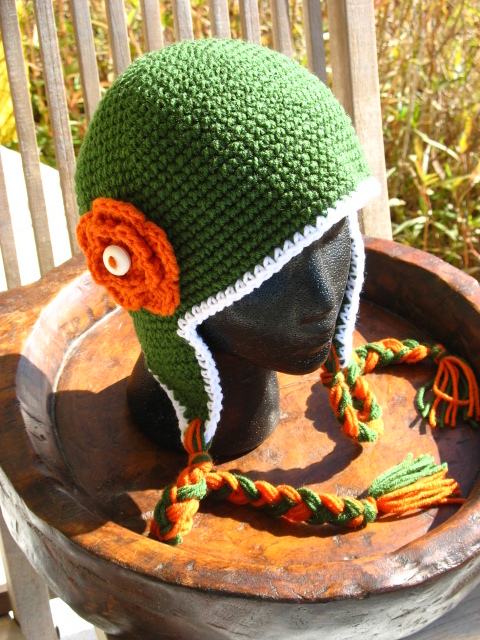 Handmade with 100% Acrylic Yarn in Thyme, Carrot and White. Get your Vitamin C from these Monterey Lime Wristers measuring 8" in length 8" in circumference at the wrist. This soft cozy scarf has been crocheted with 100% Acrylic Yarn, the colors remind me of a spring afternoon, the rolling hillside covered in green grass, the blue sky and the nice warm sunshine. Just the pick me up you need to get you thru the long dark winter! Scarf measures 76" in length and is 5.5" wide and features 6" of fringe on either end. 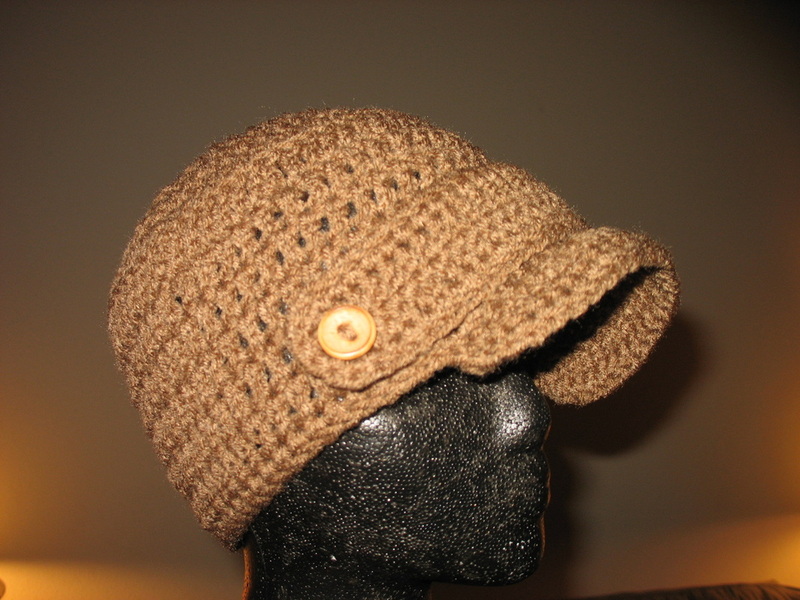 Here is our Classic Hattycakes Earflap Hat, so Cozy! 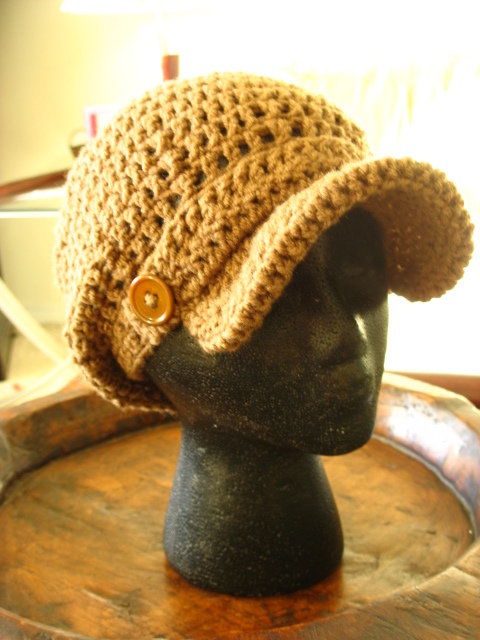 The Classic Hattycakes is handmade, crocheted hat featuring a Neckflap and Earflaps for warmth and Braids and Pom Pom for fun. 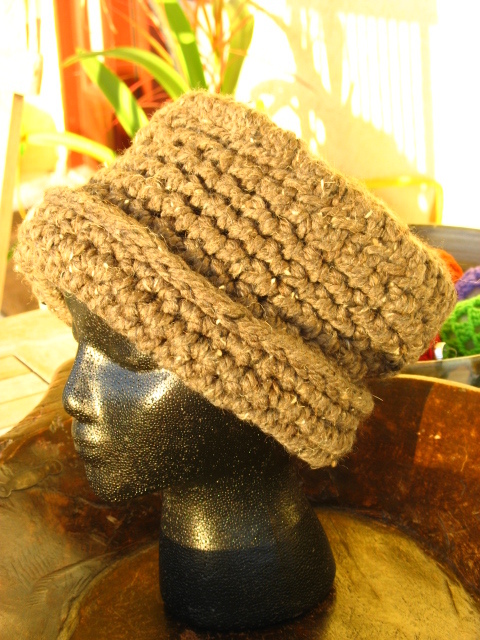 This hat is an Adult Medium and Measures 22.5" in Diameter, the Hat Height in Front is 8" and the Hat Height in Back, including Neck Flap is 9", the earflaps measure 4" in length and the braids are 14" in length, the Pom Pom Measures 3.5" Across. 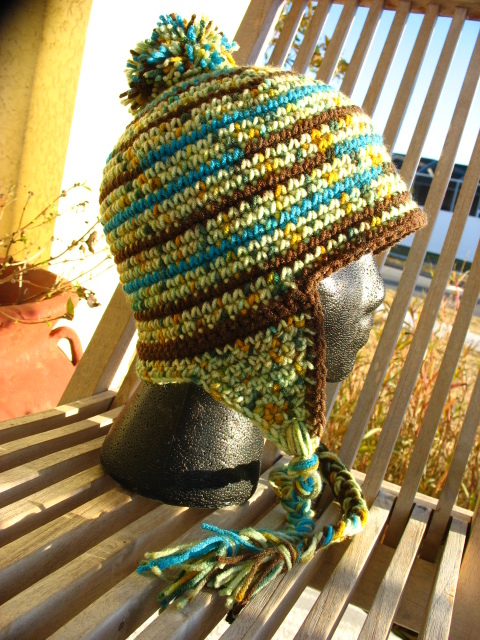 Crocheted in a warm, soft 100% Acrylic yarn with colors reminiscent of a serene Riverbank. Infant, Children and other Adult sizes/colors also available, please comment below for options. 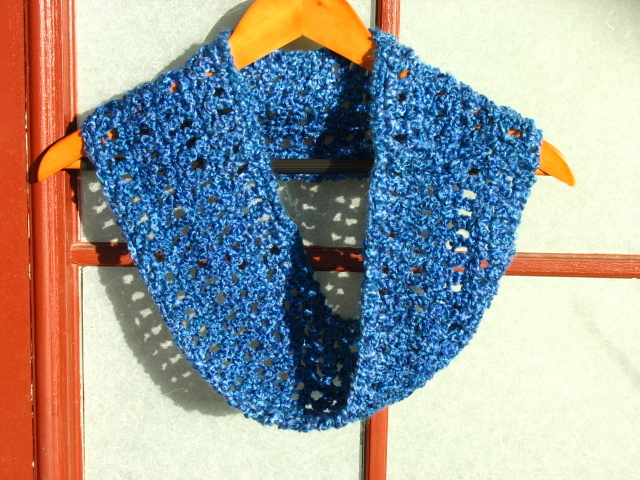 This Soft Infinity Scarf has been crocheted with 100% Acrylic yarn and measures 36" in length and is 7" wide. It may be worn around the neck or pulled down on the top of the shoulders. This Infinity Scarf has been made with a twist in the fabric so it will lay nicely around your neck and keep you warm and looking great. Infinity Scarves are the perfect addition to your winter wardrobe to have the warmth of a scarf without the added bulk. 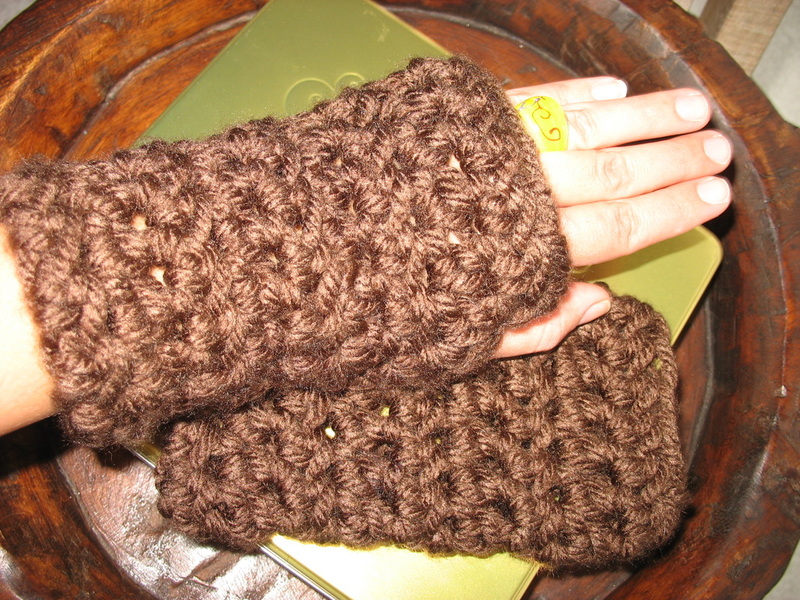 Fingerless Gloves are the must have item to add to your winter wardrobe! Sure, they're adorable, but they're so much more than just a pretty face. 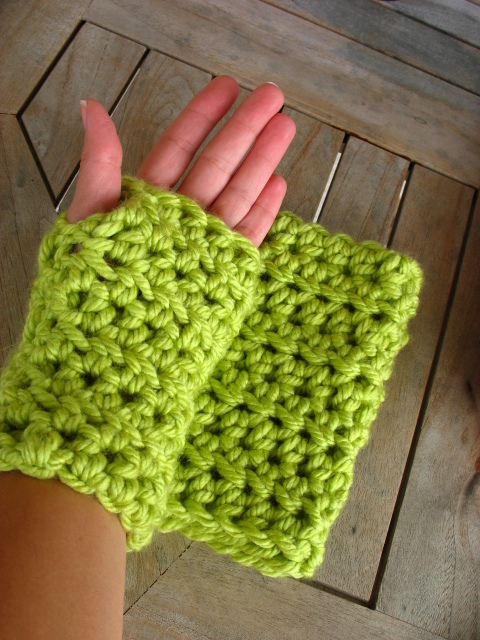 These keep your wrists and hands warm while leaving your fingers free to text up a storm, take care of "doggy duty", unlock your doors, drive the car, and all of the other tasks that other mittens and gloves render nearly impossible. They are so comfortable you'll find yourself not wanting to take them off the moment they come in the mail. They couldn't possibly be easier to care for either, Machine wash, tumble dry low. Other colors are always available, please email for options. 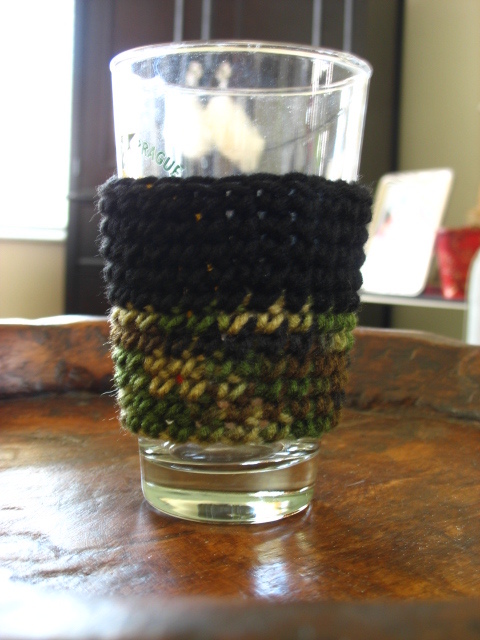 This Camouflage and Black Reusable Cup Cozy is handmade with 100% Acrylic Yarn. Machine Washable and Dryer Safe, this reusable cozy is much more friendly for the environment than those Cardboard Sleeves used by most Coffee Houses. Helps keep your drink hot and your hand comfortable. Also fits on plastic disposable cups for cold drinks, and a Pint Glass to keep your frosty beverage nice and cold... soaks up the condensation to keep your table dry to boot. Save the planet and show your individuality. 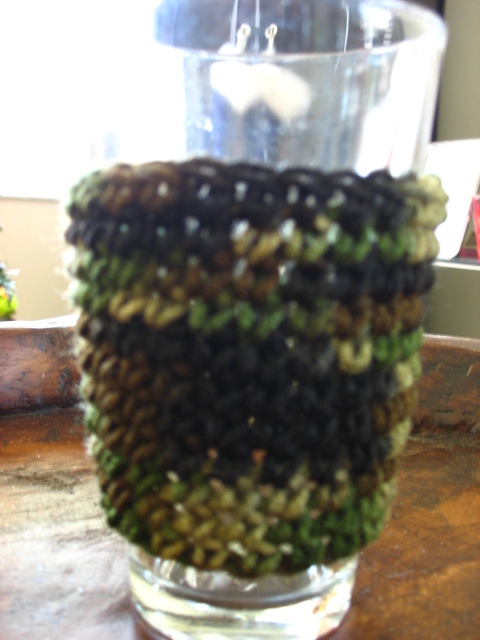 This Camouflage Reusable Cup Cozy is handmade with 100% Acrylic Yarn. 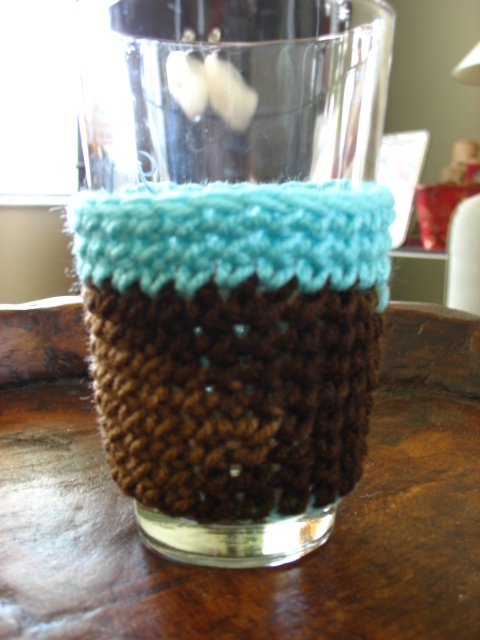 This blend of Earth and Sky and Aruba Seas Reusable Cup Cozy is handmade with 100% Acrylic Yarn. 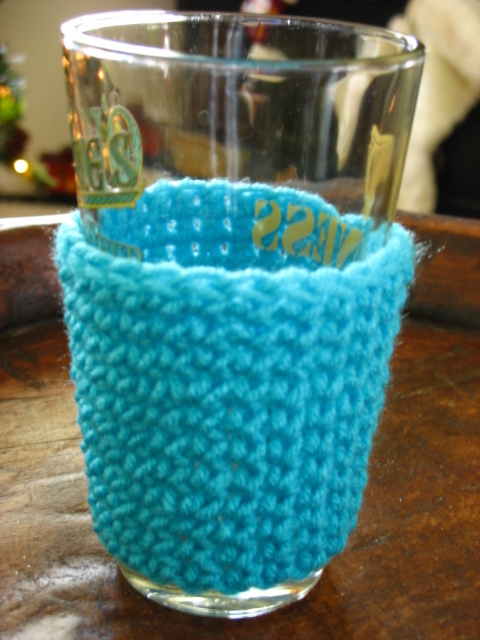 This Turqua Reusable Cup Cozy is handmade with 100% Acrylic Yarn. Ever so soft and cozy in a delicious, stylish white, pink and brown Neapolitan Acrylic yarn this adorable Hattycakes Crochet Granny Squares Blanket makes a great shower gift and is sure to be a prized possession for years to come. Sized perfectly to cover baby in the car seat, infant carrier or stroller, or to help Mom cover up for some privacy and warmth during feedings. As baby gets older the holes are perfect for little fingers to hold on to when toddling around the house. Machine wash, cold, gentle cycle in mild detergent, tumble dry, delicate cycle or lay flat to dry. 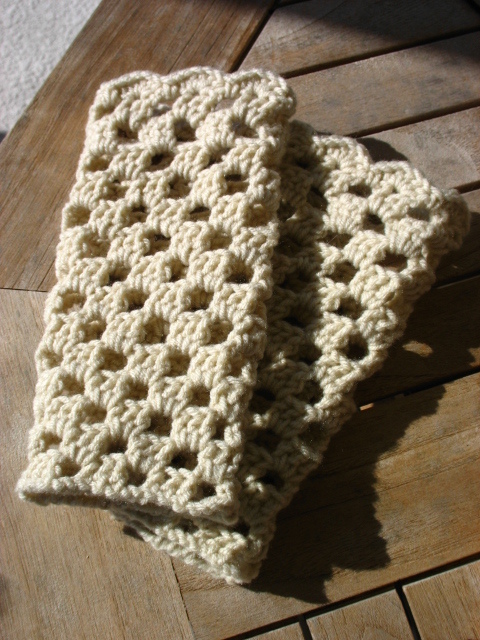 Crocheted with love in a smoke-free doggy friendly (with restrictions)home. This super sweet SZ 3-6 months Baby Earflap Hat with Braids is sure to be a hit for the upcoming cooler months! 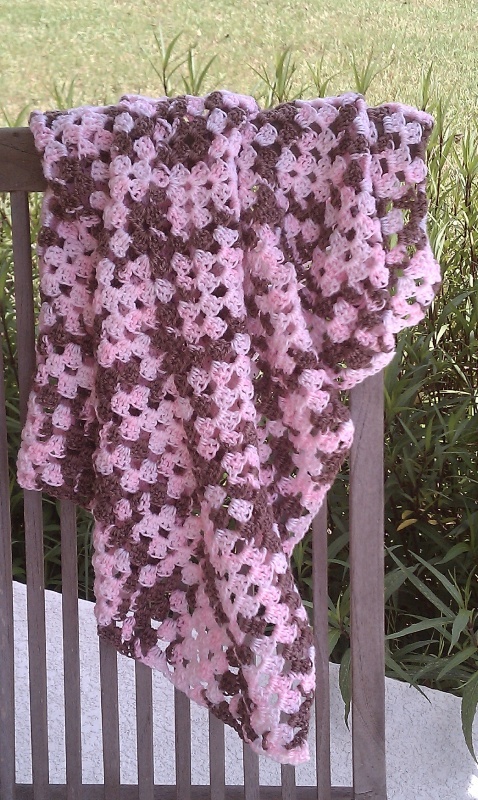 Handmade, crocheted in 100% Acrylic Poodle Pink, Chocolate Brown and Angel White color Yarns. This Earflap Hat has cute little Braids and extra length in the back to keep baby's neck warm and toasty, has a Circumference of 15.5" -16" and a Hat Height of 5.5" in front 6" in back. The front can be folded up a bit to fit infants younger than 3 -6 months. 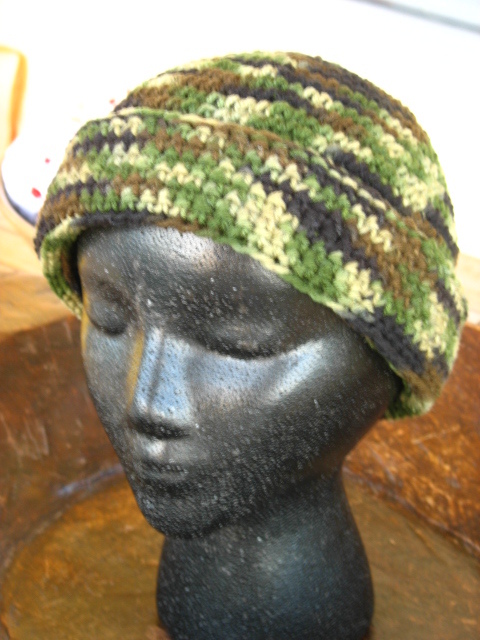 The stretchy nature of Crocheted Fabric will allow for baby to wear this cute hat for a while. 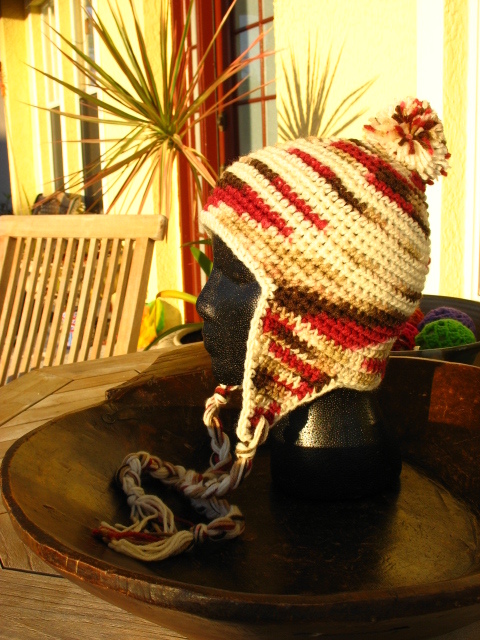 Handmade, Crocheted using Red and Ecru 100% Cotton Yarn. This Drawstring Wristlet Purse with Dark Brown Wooden Beads is stylish and fun. 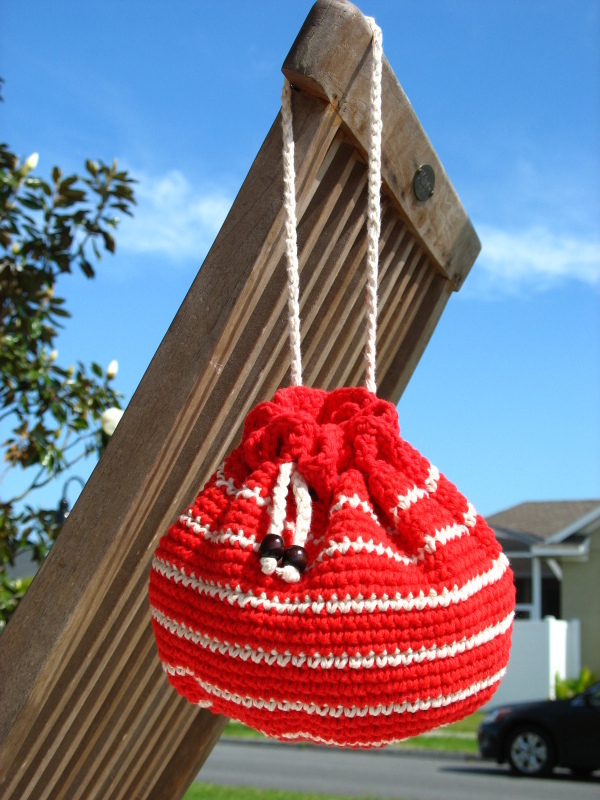 When open, this cute little purse measures 24" in circumfrence, 7" high. The drawstring measures 19" when the bag is cinched closed. This Crocheted Lavender and White Striped Reusable Cup Cozy is handmade with 100% Acrylic Yarn. 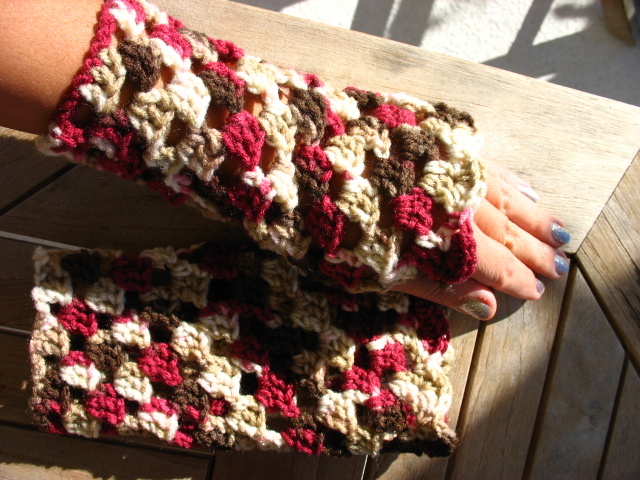 This Crocheted Multi Color Reusable Cup Cozy is handmade with 100% Acrylic Yarn called Monet.